Sometimes I keep on top of where my books sit on lists and other times they escape me. 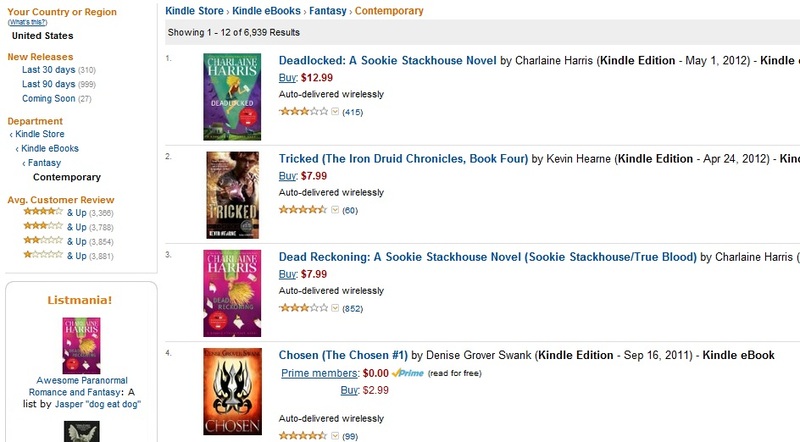 In fact, this past February I had no idea that Chosen was #1 in all of Science Fiction and Fantasy in the entire Amazon store. Print, audio and eBooks. I would never have known if Ashelynn from Gypsy Book Reviews hadn’t notified me. 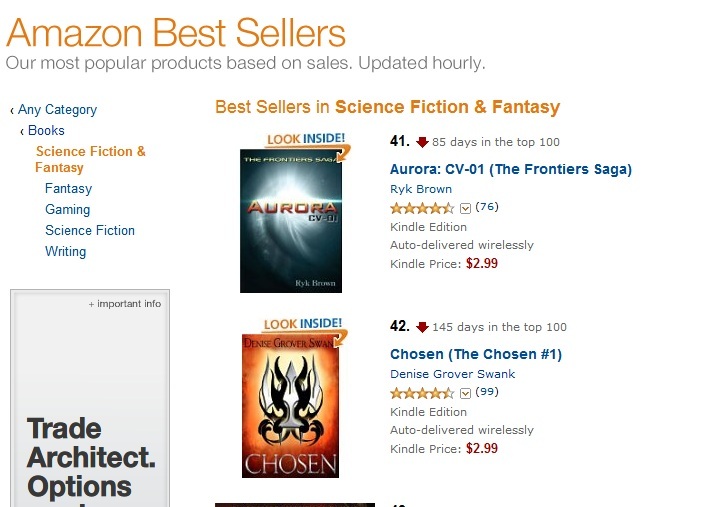 Chosen has been in the top 100 of Science Fiction and Fantasy for 145 days and I didn’t even realize it. *head desk* Maybe I should pay more attention to these things. Part of the reason I was looking was because of the recent rumors are floating around that Amazon has changed their algorythyms again. This time they are playing with the popularity list. Did you know Amazon has a popularity list? Honestly, I often forget about it, which is bad on my part. Readers often think the popularity list is the best seller list, so a book’s ranking on the popularity list can be a huge factor in sales. But the best seller list and the popularity list are two very different things. Then you click on your genre of interest and Amazon shows you the most POPULAR books. Not the best selling books, the books that Amazon deems popular. In fact book rankings on the best selller list and rankings on the popular list are VERY different things. At this exact moment in time, Chosen happens to be both #4 on the contemporary fantasy Kindle best seller list AND the popular list. 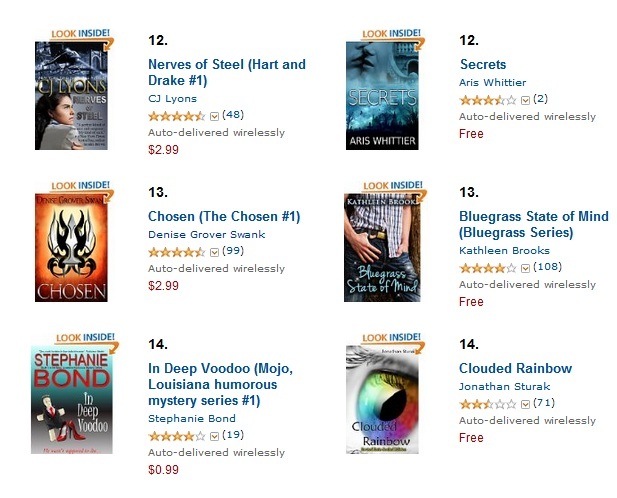 But Chosen is #11 in the Kindle Romantic Suspense Popular list. Why the difference? The question is how is this list determined. No one really knows since the secret of Amazon algorithms probably have a higher top secret classification than the nuclear missile codes . But that doesn’t stop people from trying to figure it out. Again, until recently, I really didn’t pay much attention to this list until authors began suggesting that the popularity list is part of the fall of the Great Free Book Promo. There’s no doubt that the Free Promo doesn’t work like it used to. I have my own theories– glut of free books is at the top of the list– but some authors think that the algos no longer favor free books. The number of downloads when a book goes free seems to be a factor that goes into this list and many attribute it to part of the previous success of the free promo. The more free downloads, the higher the book shoots up on the popular list. But people studying the list think that free downloads carry far less weight now, thus affecting the books ranking on the popularity list. The lower the ranking, the fewer the sales after the promo. But what I find even more disturbing is that some have proposed that higher priced books are getting more weight since May 1. I firmly believe the price difference in traditional books and self-published books is one of the biggest factors in making self-published authors so successful. My fourteen year old daughter received a Kindle Fire for Christmas. While she didn’t use it much the first few months of this winter, in April she realized that there was a world of books that were often good quality and 1/3 the price of traditional books. For a girl who reads 2-4 books a week and only gets a $40 monthly book allowance from her mother (supplementing her other book purchases with babysitting money) she realized that she could get MORE books for the same amount of money. This is why the possible swing to higher priced books concerns me. If Amazon favors higher priced books, they in turn favor traditional publishers. The argument can be made the the way to fight this is for the self-published author to raise the price of their books. And they have. In my opinion, the Amazon Select free promo option has replaced the introductory $0.99 book for new authors. Readers are trying out new authors for free enabling authors to raise eBook prices across the board. Still, most indie eBooks are between $2.99 to $4.99, much less than Big 6 books often priced $9.99 and up. And like my daughter, readers are currently buying more indie authors because they can read more books for the same amount of money. But if the free promo is failing, and the popularity list favors $9.99 books, where does that leave the self-published author? If the proposed change is true, I think we’ll begin to see even more separation between successful and less successful SP authors. Indie authors who have already established a reader base will continue to sell books, but newer authors will have to fight even harder to get a toe hold in the rankings. Few people are going to take a chance on a low ranked, unknown author with only a handful of reviews if their book is comparable in price to a Big 6 book. If the reader can even find them. The beauty of the current publishing world is that things are always changing. The nightmare of the publishing world is that things are always changing, literally from month to month. This brave new world is not for the faint of heart. Indeed it is not for the faint of heart! Very informative, thank you! And congrats on CHOSEN making so many of the lists!!! Hi Denise! 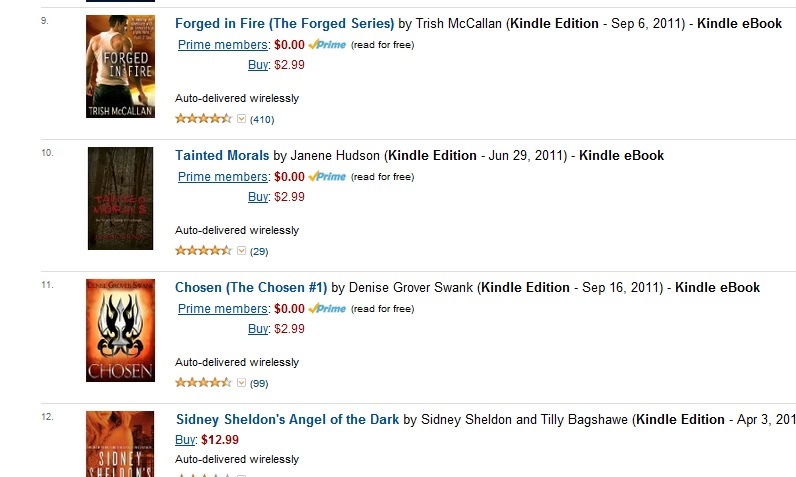 I just bought CHOSEN, from a referral of one of your friends on the Kindleboards, and I look forward to reading it! Hello There. I discovered your weblog using msn. This is a very smartly wwritten article. I wioll make sure to boomark it and return to rad extra of your helpful information. Thanks for the post.